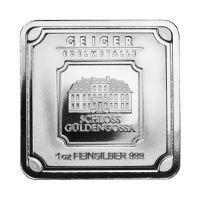 Barra in argento 1 oz Geiger Edelmetalle Geiger Edelemetalle is continuing a tradition of silver refining that dates back almost 800 years! These bars have a unique look, and are a little chunkier looking than other similar sized bars. All of the bars have ribbed edges, similar to a coin to provide you with extra confidence. The image on the reverse is of the Baroque Castle Guldengossa, the company's headquarters near Leipzig, Germany. The obverse is stamped with the weight and purity of the bar.